I thought that this week we could make a rather lovely Valentine's gift that would not break the bank (it cost me less than £7 or just over $10!) but would show that you cared... so here is a simple but effective picture based on the perennial theme of St Valentine's Day. 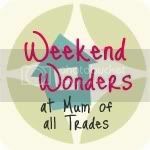 Take the back off your decoupage box and trace around it to form your background. Cut out the square and glue it lightly to the background square. 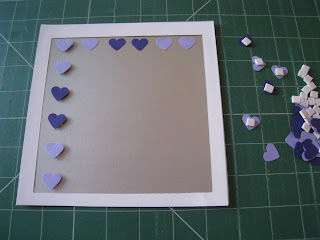 Now decide on your design, I am going to try two, one in the shape of a heart and the other as a simple square pattern. Use the cover sheet that is in your frame box to create a frame for you to work within. 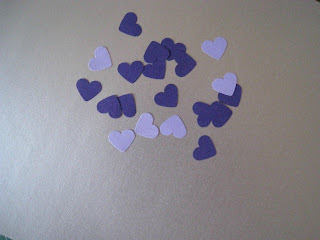 Using your punch cut out your hearts and place them on the backing paper to see if it works. Turn on your glue gun. Take each heart, place the ruler down the centre of the heart and run the cable needle along the edge as we want the heart to fold up. You may find it a good idea to put a small pencil dot on the backing paper so that you can see exactly where you will finally place your heart. Now run a small amount of glue along the fold and press firmly in place, continue doing this until you build up your design. As the hearts that I was using are quite petite, I whipped out my eyebrow tweezers to help place them at the appropriate point. 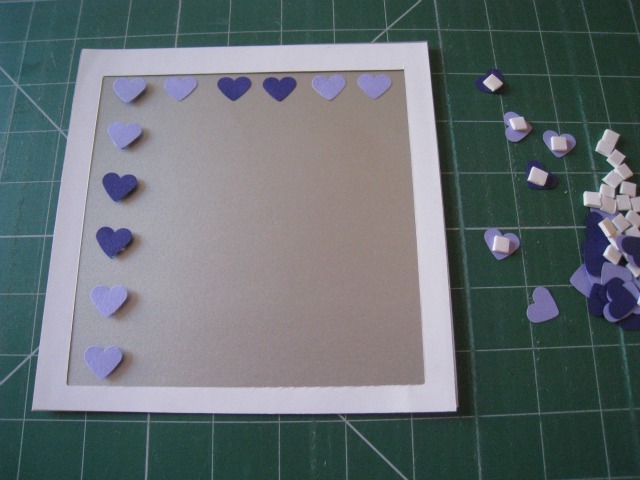 And for the harmonious square of hearts, use a small square of double sided sticky back foam to stick them to your backing paper. Let your work dry and then place it back in the decoupage frame. I also thought of doing a heart made from the pages of the map book we used to create the bows at Christmas which we found in the Charity shop... and I thought you could call it, "A map of my heart", or you could use pages from an old book and say "You read my heart like a book..."
Finally, you can also paint the decoupage box frames to fit in with your room colour scheme. Now go take a look at 1st Unique's Handmade Monday, can you believe that Wendy has been doing this for almost a year? This is week 49, where has the time gone? Now, I going to give you a quick preview of next week's tutorial... it is a pattern for a hat and matching scarf, as you can see I have almost finished the scarf but I need to crack on with it, so I thought if I told you that I was posting it, I would have to finish it! Looks like great fun! What a super gift for the one you love. They are lovely Ros and a nice idea. Love the colour purple and its various shades. Have a good week. Gorgeous - simple and extremely effective. Would be lovely with maps! That's a lovely idea that could be adapted for many occasions. Funny thing - yesterday my husband was clearing out his cupboard and came across an old pocket atlas. He asked if I thought it worth keeping and I said that I'd seen a project using old maps, but try as I might I couldn't bring it to mind. 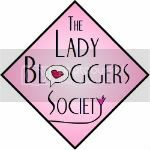 So thank you for mentioning it in this post! Very effective! and will make a lovely present. Such a neat idea, and think of all the different papers you could use! I collect paper and have boxes and boxes (who doesn't?). As always..you rock! Love the heart idea. Simple and really effective! As always, who needs to look for inspiration when we have our very own crafty muse! Ros, these are very pretty, a great gift for any occasion. Yet another fab tutorial - thank-you. Love the hat and scarf set, so will wait eagerly for those! 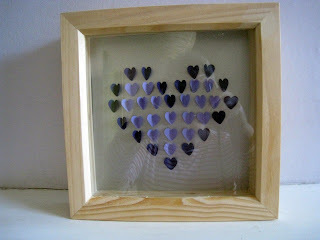 I've seen a few frames like that in charity shops, now I have an idea how to use them! Can just imagine using a sea creatures theme in a bathroom... oo you have me thinking now! This is such a sweet idea and so simple! Thanks for sharing. This is simple but still an effective way of showing love on valentine's day. Perfect for some one who is a big fan of photo frames. Do you have some more thoughts about gifts for other occasions? The 1930s are just bang up to date!